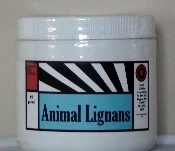 Natural Animal Lignans Supplement has shown in some animals to help with arthritis symptoms. Mix with moist food or sprinkle in milk. Get 1/2 pound jar for $19.99. Feed no more than one scoop a day. This is a new product to the pet industry. What benefits it has for animals, haven't been determined at this time. Pets seem to be able to move around with less stress to the joints. Always make sure the pet has a fresh water dish.